A mighty fine pot which has some pretty decoration which is unusual for so active a pot. 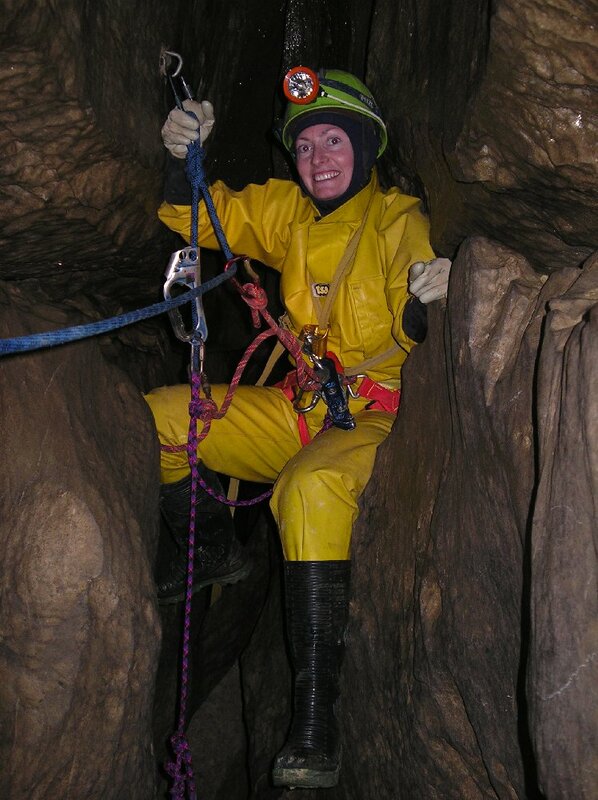 A damp but very pleasant cave, which exceeded my expectations. This was rigging practice for me. It was my turn to get hung up when my foot loop got stuck whilst sliding out of a tube - I ended up hanging from the rope and the foot loop with the hand jammer at a frightening angle. It's both a long way up the hill to the pot with a lot of rope and a strenuous trip underground. I felt like when I got out of Juniper Gulf. 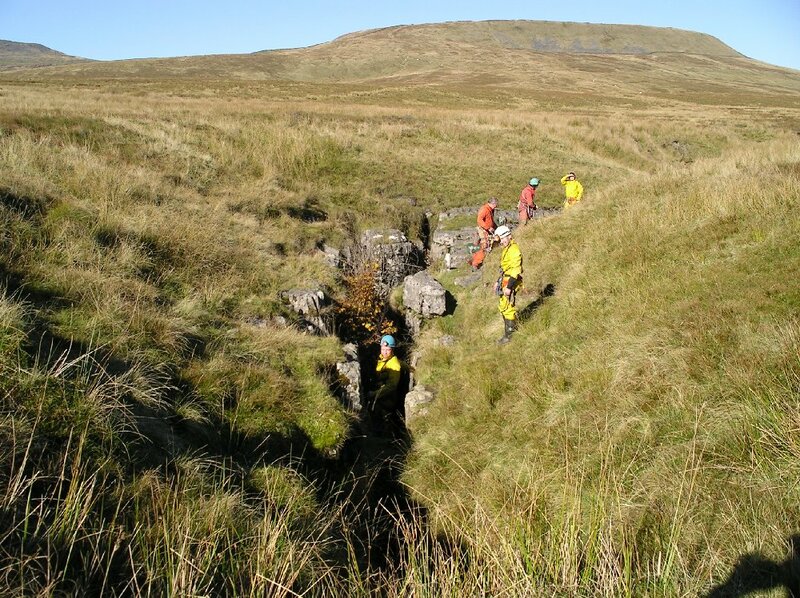 Gaping Gill was as impressive as always. It's a shame that the walk is so far with 160m of rope shared between two. Tony got hung up at the re-belay at the top of the last pitch, unfortunately he got off before I managed to rig a rescue. We came out into 100m visibility, it was more pleasant underground. An interesting but relatively short SRT trip in the far away valley of Nidderdale. Sunshine made for a pleasant day. After the rest of us had left and were nearly home Brendan was called out to search for an overdue party. After a Land Rover ride up to Top Entrance the party were located in Gnome Passage. 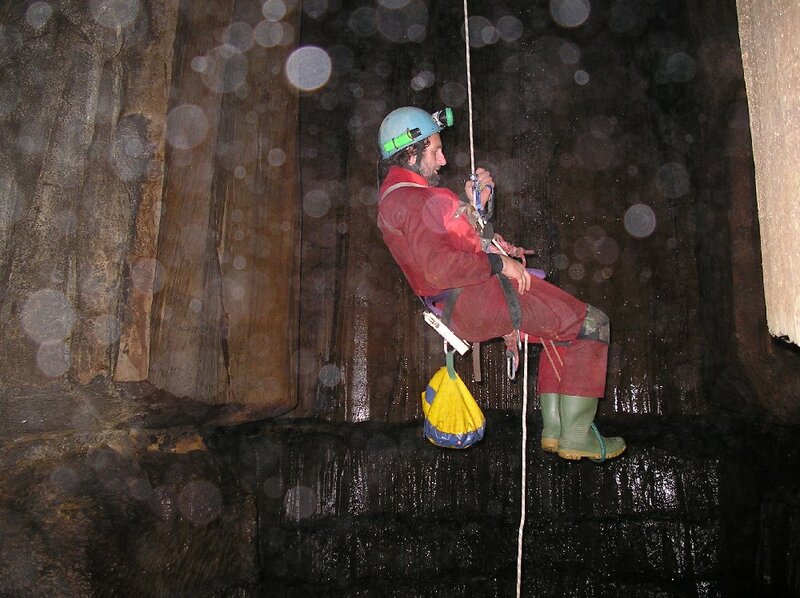 All in all a very packed caving day. A quick look in the cave revealed that nothing had changed since our last visit in September. Colin and Brendan took the opportunity to complete the round trip. On the way back up-hill from OFD 1 we completed the through trip in this well-decorated system. We were particularly impressed with the "car tyre" formations and the fantastic reflections from the floor littered with "broken glass" crystals. Everyone turned up in wet-suits and neo-fleeces except no one had thought to tell the novice (Seb) who only has dry gear, that it was a wet trip. We decided to go downstream for a change which meant two knackering walks up-hill, and it was a little bit more than the standard through trip, we took in Top Waterfalltoo. On the way back from Top Waterfall we found the way up into the lower end of Pendulum Passage. Keith fell off the climb up into the Great Oxbow but survived without so much as a scratch. All of this was done in a mere 5¼ hours. The big one completed in a little under 6½ hours, plus an hour's walk each way. Lovely classic Yorkshire clean-washed pitches - pity about the traverses between them! The team and the entrance rift. Graham Smith rigging. Emma Porter negotiating the roof traverse between pitches two and three. Mike Clayton rigging the final 175' pitch. Andrew Cross about to start the long slog up pitch three. Present: ACr, MCl, KEd, EPo & GSm + special guest Steve Tomalin. This was another training trip for Juniper Gulf. 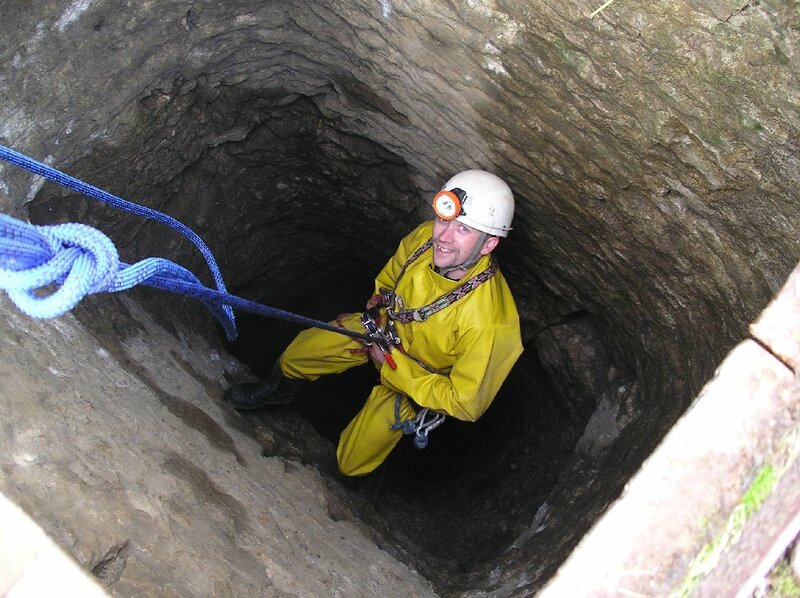 The mined entrance shaft is 225 feet deep and breaks into a large natural cavity. The trip only took 2½ hours and after getting changed we went and eventually found the Titan dig. 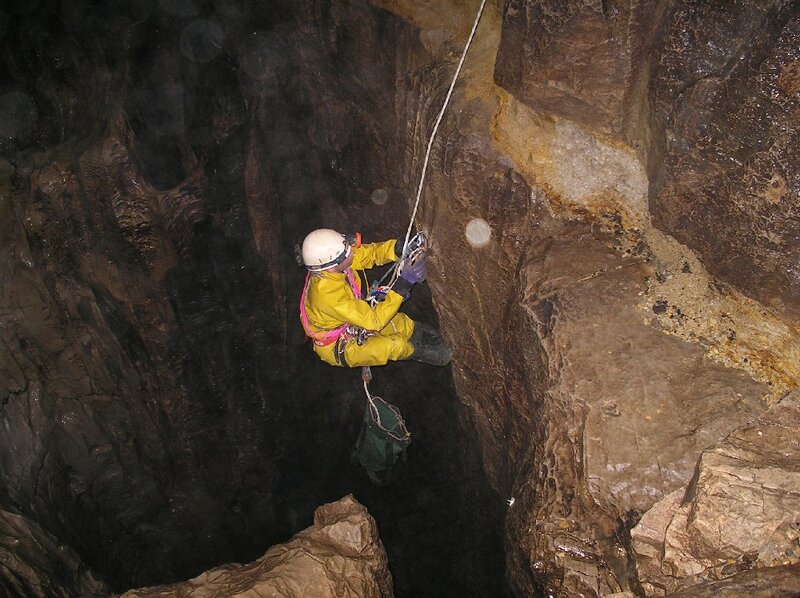 Mike Clayton descending the 225' entrance shaft. More much needed SRT practice for the Juniper Gulf trip - 7 'downs and ups' (approx. 420') followed by sausage sandwiches and tea at the Bizarre Cafe and back in time for lunch!